In Mark Cousins' delirious A Story of Children and Film - a remarkable cinema-essay focusing on young characters in movies from around the globe - the director takes a trip across time and space to present to us Yoon Yong-Kyu's 1949 feature A Hometown In Heart and its tale of a child monk Do-seong (Yoo Min) torn between the secular and the religious worlds. Perhaps the first true classic of Korean cinema, Yoon's delightful fable is also the first of many beautiful movies created in the Land of the Morning Calm to show us the sorrow and the pity, the joy and the ecstasy of being young and discovering the world around us. In recent years, South Korean cinema has given us films such as Oseam, Treeless Mountain and Wedding Dress, each of which transports us into the alien, and bittersweet world, of childhood - a land of unique sadness and growth. 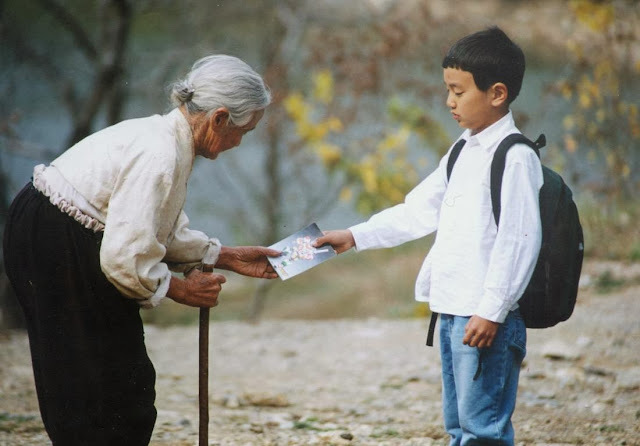 Perhaps the greatest of the modern South Korean movies of childhood, however, is Lee Jeong-hyan's Grand Bell Award winning The Way Home (Chib-uro) - a gentle and heart-warming story of a city-born 7 year old Sang-woo (Yu Seung-ho) who goes to live with his 75 year-old, illiterate, mute grandmother (Kim Eul-boon) in the rural countryside. She moves slowly, creakily, her pace frustrates him. He has lived a life of takeaways and instant junk food, she does not even have running water in her home - this angers him. When his Game Boy batteries run out from overuse, she cannot afford to replace them - he retaliates with malicious, insolent, vengeance, destroying her chamber pot, throwing away her shoes and draws graffiti on her humble home. She lacks many of the qualities of the modern world he has become accustomed to. Equally she has unconditional love for him and infinite patience - qualities which are as alien to Sang-woo as a house without a tap. In a film which could have easily descended into mawkishness, The Way Home is protected by its earnest authenticity. Lensed entirely on location, the feature boasts two of the most naturalistic and moving performances in cinema history; remarkably both are by debut actors. Yu Seung-ho (now an established thespian) portrays his character with a youthful enthusiasm and a refreshing lack of vanity whilst Kim Eul-boon's remarkable turn is made all the more incredible by the fact she had never so much as seen a film before starring in The Way Home. Bent rigidly in two from a life of carrying water and hard labour, Kim does not so much as play her character - she simply exists as her on-screen. In a slender 80 minutes, Lee's deceptively simple fable presents us a world in which materialism, and status anxiety, are destined to tear us apart. It is love, pure, simple, modest and immutable, which brings us together. We may enjoy Game Boys and KFC, technology and instant food, but there is nothing as important in life as the bonds we form with others - and nothing forms them like kindness. Here is a story of children and film. And the eternal wonders of love.